The East Tennessee Symphony Orchestra is honored to perform during the City of Collegedale’s third annual Christmas Tree Lighting Celebration Sunday, December 2, at 7 p.m. The free family-friendly event will take place in the climate-controlled Founders Hall at the Collegedale Commons located on Swinyar Drive. The orchestra will kick off the celebration with an hour-long performance featuring classic sing-a-longs and Christmas jingles. 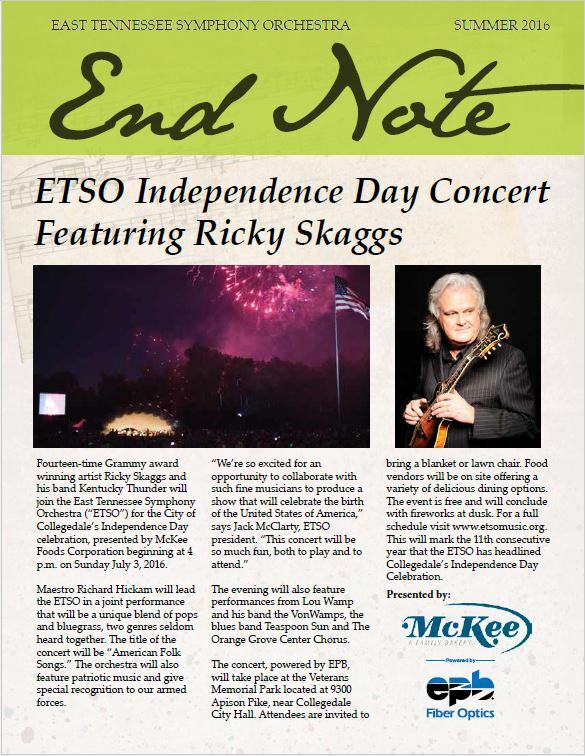 “We hope everyone can come out to enjoy beautiful world-class symphonic music to start the season with great cheer and fellowship,” says Mathew Miller, executive director of the ETSO. Miller says he is excited for the symphony’s second performance at Founders Hall and looks forward to future performances at the new community venue. Miller says the ETSO remains hopeful that the completion of the Founders Hall will serve as a catalyst to spur the next phase of on-site development at the Collegedale Commons – a world-class outdoor amphitheater.